The Mill River restoration, one of the more ambitious aquatic-connectivity projects in Massachusetts history, is nearly complete in Taunton. The removal of West Britannia Dam, completed last February, opened up over 30 miles of river for migratory and resident fish. The dam removal was the final element in a 10-year project to remove three dams on the Mill River and build a fish ladder on a fourth dam. Massachusetts Division of Environmental Restoration Director Beth Lambert said that more than 10 organizations and agencies pooled their skills and resources to bring the project to completion, including the city of Taunton. West Britannia once supplied the power for the Reed and Barton Silversmith factory. As part of the Mill River Restoration Project, the Hopewell Mill Dam was removed in 2012, the Whittenton Dam was removed in 2013, and also in 2013, the failing Morey’s Bridge Dam was rebuilt. The new dam includes a new fish ladder and eel ramp. In addition to opening up important habitat for sea-run and resident fish and wildlife, the dam removals also reduce the threat of flooding and restore water quality. “This is a very exciting time for us in terms of the scale of this project and now being able to open up this Mill River after some 200 years,” said Lambert. 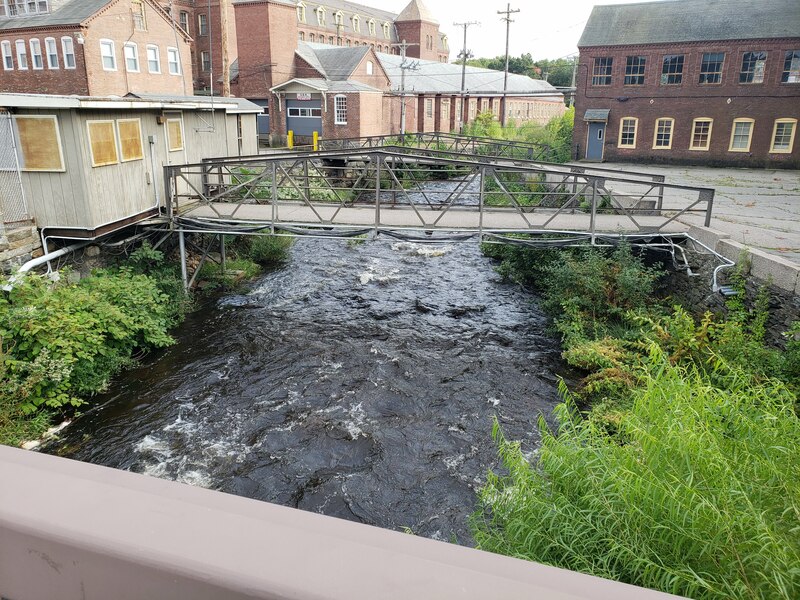 Aging dams of Taunton came under public scrutiny and from national news outlets after the Whittenton Dam, a 12-foot-tall wooden dam on the Mill River, began to leak and threatened to break in the fall of 2005. “When Whittenton Dam began to buckle,” said Lambert, “the City of Taunton was forced to evacuate downtown and 4000 people were temporarily relocated. That dam safety crisis catalyzed the national, state and local groups and the dam owners to think about the future of three aging dams on the Mill River.” The local planning agency brought together the dam owners with the city, nonprofit conservation organizations, and agencies and the Mill River Restoration Partnership was born. A $650,000 grant from the National Fish and Wildlife Foundation through its partnership with the U.S. Fish and Wildlife Service Hurricane Sandy Coastal Resiliency Program supported the West Britannia Dam Removal Project. Inter-Fluve, Inc. led engineering and design work, while RC&D carried out the construction. Removing dams is a costly and time-intensive undertaking. Leaving crumbling dams in place, however, could potentially cause catastrophic flooding and risk to property or safety. This project improves public safety and water quality, while opening up 30 miles of rivers and streams to fish like River herring, American Eel, sea lamprey and other migratory and native resident fish that will be able to access habitat vital to restoring and maintaining their numbers. The project improves not only the fish passage but also water quality for the fish and wildlife habitat and permits the free flow of the river. The river can recover and maintain habitat for all types of fish and wildlife. The West Brittannia Dam removal was the final leg of the marathon to restore the Mill River, a tributary to the Taunton River, which ultimately opens into Mount Hope Bay. The textiles and manufacturing history of southeastern Massachusetts and Taunton in particular contributed to the apt name of the river itself. Massachusetts has over 3,000 dams, many of which were built over 200 years ago. While once serving vital economic roles, dams create unnatural habitats and impede the flow of water and sediment in aquatic systems. These aging man-made structures are potentially hazardous during periods of heavy rain or during superstorms like Hurricane Sandy, which hit Taunton on Oct. 29, 2012. Research will continue in the Mill River with species monitoring and habitat restoration efforts planned through 2019. See this article where it originally posted in the Taunton Gazette.